There are lots of little food marts and small grocery stores on Cape Cod, neighborhood favorites where we stop in for a quart of milk or a loaf of bread. But, when it's time to stock the fridge with "real food", a trip to one of our major supermarkets - Market Basket, Stop & Shop, Shaw's, or Trader Joe's - is in order. If you're planning to whip up a few easy meals while you're here, (a great way to save on your vacation costs, by the way! ), you'll likely need to make a trip to the grocery store sometime during your stay. When I heard that a MarketBasket was coming to Cape Cod, I thought, "Eh. Another grocery store. So what?". Oh, silly me! Little did I know that food shopping was about to turn into a pleasant, reasonably affordable, experience. From the day the sparkling clean new store opened in mid-2012, Market Basket has been the locals' go-to spot ... even if we have to drive a half-hour or more to get there. Take Route 6 to Exit 1C in Sagamore (Bourne). Market Basket is in the plaza by the Sagamore Bridge, on the south side of the Cape Cod Canal. Stop & Shop Supermarkets has more locations on Cape Cod than any other major grocery store chain. If there's one near where you're staying, and you don't feel like driving to the Market Basket in Bourne, then Stop & Shop is a perfectly fine place to do your shopping. 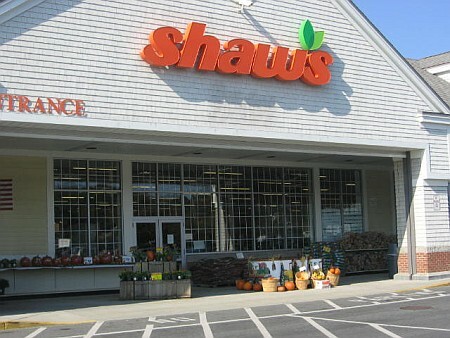 Shaw's grocery stores have been around on Cape Cod forever - at least it seems that way to me. I think it's the first food market I went to as a vacationer way back when. And I still go there on occasion now. All in all, Shaw's prices aren't bad, and I can usually find everything I need without any hassle. So I'd say "go for it" if there's a Shaws near you. If you're looking for the cool vibe and great food Trader Joe's offers, you'll be happy to know there's one in Hyannis. Folks have been wishing for a Whole Foods on Cape Cod for some time now. As of May 2014, it's happened. Whole Foods is finally here!